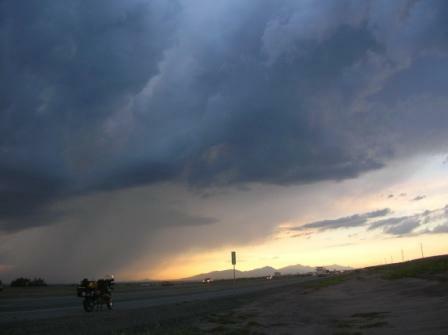 August 2006: I’m on the motorcycle, rolling westbound on I-10 outside of El Paso in western Texas in the early evening when I see a huge dark cloud build up to the south. It’s so impressive I stop and take a few pictures as I put on a jacket. The cloud keeps growing and getting darker, promising rain (rare for this part of the country). When the rain finally comes down, hard, I bail, looking desperately for a building with an overhang — a car wash, a bank with a drive-through window, a funeral home (don’t laugh, I spent an hour at one during a downpour in Eddyville, Kentucky). In Socorro I find a darkened school administration building with a recessed entry way and nearly empty parking lot and I ride the bike right up the handicap ramp. The entry is 30 feet wide, 10 feet deep, and totally dry. Perfect! A stack of sandbags lines one inside wall. I back the motorcycle into the opposite corner and set her up on the centerstand. Then I put my helmet and gloves on the top row of sandbags and sit down…I find it’s really comfortable, because the wall is angled inward toward the windows, giving me a natural place to recline. I relax on the bags and watch the rain pour down. I’m dry and I have a half bottle of Gatorade and a package of peanut butter-and-toast crackers. Things could not be any better…I feel almost smug. The rain continues to alternate between moderate and ferocious. A little over an hour later, the main door opens and a janitor comes out. He glances at me, says hello in a friendly way, and turns to watch the rain.